We currently reside in Toledo, Ohio with our four dogs. 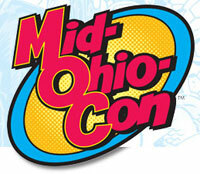 Mid-Ohio-Con was an easy show for us to attend since it was only about a couple of hours away from Toledo. It was a smaller show than our previous two but it wasn't less worth our time. We met a lot of great artists and sketched for Convention Goers. Bekah and I came away inspired and excited to draw and write. Anytime you can do that, it's time well spent. Special Thanks: Tim (Iron Man Sketch Card), Dave (Hulk vs Wolverine), Shannon/Brad (Spider-man), Steven (She-Hulk), Daniel (Spider-man), Andy (Wolverine), Dara (Thing w/ bird), Brandon (Spider-man), Patrick (Hal Jordan), Adam (Ice Man), Robert (Iron Man/Spider-woman covers), and to all the others I may have forgotten for keeping me on my toes. For our second convention this season, we traveled up North of the border to beautiful Toronto Canada for the FanExpo 2008. The convention combined several different genres including Horror, SciFi, Comics and Anime. This made for an interesting mix and a fun show. We had a much better setup this time around and I think it paid off. A word of advice for all you who consider gettting a table in an Artist Alley, get yourself a banner. We feel that our sales and interest jumped dramatically due to the banner and better signage. I think people had little doubt as to our intended audience upon seeing Dr. Graves' grin. Aside from an increased variety of art, we again offered sketches. I can't imagine ever not doing this at conventions. Getting unexpected requests, keeps the day interesting. And with little or no references on hand, it makes me really think. Not to mention this gives me "real-time" feedback from my audience. I can see what's working and what's not. Nothing tells you more when you can't keep sketches on your table because they're selling faster than you can draw them. We're definitely heading back to Toronto for future shows. Awesome city and friendly people made for a great time and memory. Special Thanks: Tiffany (Spidey/MJ), Jill (Hawkeye), Marshall (Flash), Dave (Skrull), Wes (Planet Hulk), Dave (Data), Kyle (Masked Wolverine), Justice, Milo (Venom), Christian (Deutsch Maschine), Scott (Mallah/Shanna), David (Batman), Peter (Death), and to all the others I may have forgotten for keeping me on my toes. Gas prices couldn't keep us away from Chicago this year. Bekah and I set up in "Artist Alley" and unveiled The Charnel House. Despite the change in the show's schedule, our book and connected merchandise were finished in time for the show. Loads of people were interested and we sold lots of books and sketches. It started kind of slow on Thursday night and Friday. But once Saturday rolled around, we kept pretty busy. Hopefully we can keep this momentum going into future shows. It was definitely a learning experience, but a good one. We can't wait until the next convention. I was doing sketches in about 5-10 minutes on average. (From pencil to inks with no erasing.) Often times I was drawing while people were waiting in front of me. Sometimes when I had a list we'd ask them to come back to pick them up. We sold both sketches I drew at the stand and requests. It was a blast. Bekah was able to talk about Charnel House while I drew. We worked as a team. We took as many photos of the sketches to display. My Batman was by far the most popular. Followed by my Wolverine.